One snowy day, three robbers met at a cabin in the mountains to plan out their dastardly deeds. “I say we rob the train,” said Moe. “I say we rob the bank,” said Joe. “You're both wrong. We're going to rob the pirates,” said Bo. “Pirates? There are no pirates in the mountains. They live by the sea and sail in ships and bury their treasure in the sand,” said Moe. “Not if they're snow pirates,” said Bo. Bo, Moe and Joe put on black pants, blue and white striped shirts and bandit masks over their eyes. They left the warmth of the cabin, climbing on their sled. Down the hill they went, snow flying in all directions. As they slid down the mountainside, Joe looked to the left and to the right. “I see two pine trees. Look over there.” He pointed to a hill. “He's right. There are two and there's the other one not far off.” Bo aimed the sled toward the trees. “Now what does it say? Do we have to dig right here? Is there a cave under the trees?” Moe asked some silly questions. “Don't be a fool, Moe. Of course it's not. We have to find Three Peaks, a mountain with three sharp points. That can't be too hard to find,” Bo said. They raced the sled down another hill. “I see it. There's Three Peaks,” Joe said. “No, you fool. This isn't it, but we're not very far off. We need to look for a cave. It will be hard to see as the entrance is blocked by a wall of snow,” Bo said. “A wall of snow? How can we find a cave that's covered up?” Joe looked at Moe and shrugged his shoulders. “Keep your eyes open.” Bo led the sled down the next hill. “What are all these mounds of snow for? They look like frozen men,” Moe said. Joe looked at them. “He's right. They do look like frozen men. “But I didn't bring any gloves,” Moe said. “Use your hat then,” Bo said. “Just use your hands. Come on. We've got to hurry before we freeze to death,” Bo said. An hour later the entrance to the snow cave was completely uncovered. They saw the wooden chest full of gold coins. “Wow! Look at that gold. We'll be rich and can move to Tahiti and live where the warm sun always shines.” Moe reached for a coin. Just then there was a noise from inside the cave. Moe, Joe and Bo looked at the empty cave. A form appeared. It wore a patch over its eye, a hat, a black and white striped shirt and had skull and crossbones tattoed on his arm. “Ahoy, matey. Are ye here to rob us of our gold?” The pirate snarled and gnashed his rotten teeth. “That's no matter to ye, robber. This is our gold, not yours. Be off with ye before I put curse on ye,” the pirate said. Bo reached into the chest and pulled out three pieces of gold. “I'll take these. That's only one for each of us.” He ran off. Moe and Joe ran after him. Bo, Moe and Joe watched in horror as their thumbs froze, and then their hands, arms, and entire body. 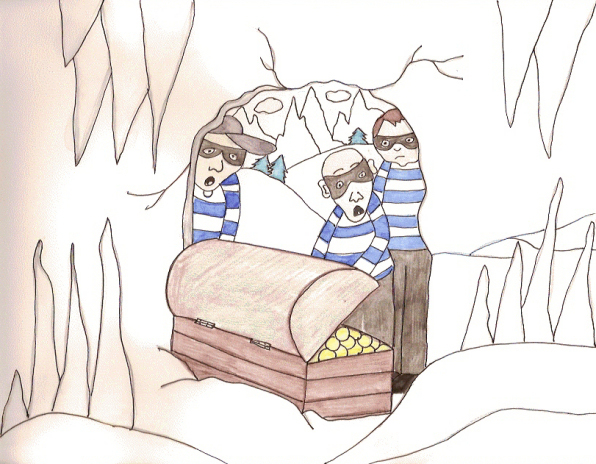 They stood silently, icy figures, surrounded by all the other men who had dared try to steal the snow pirate's treasure.